It was just before 6:00am when my alarm went off. Early mornings are generally not my friends, and it took me a minute to remember where I was. As the haze cleared from my brain, I realized I was in Parma. And it was time for cheese! After a quick breakfast, we headed out for a short drive through the Italian countryside. Unseasonably cool for a mid-summer morning, a bit of fog hung over the wheat fields as we wound our way toward the dairy. 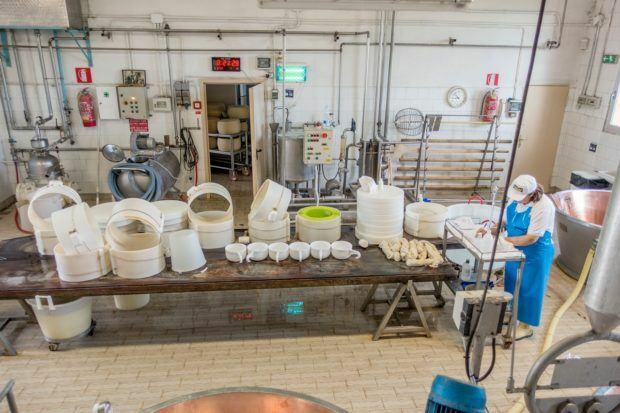 Almost immediately after arriving at Caseificio San Pier Damiani, the reason for our early wake up call was clear—the milk was here, and it was time to make Parmigiano-Reggiano. 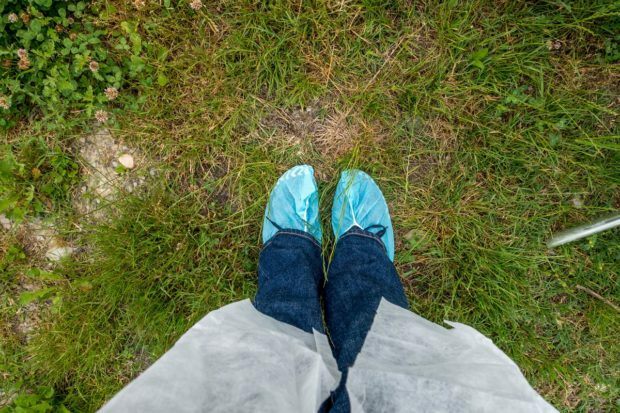 While the milk truck started to offload its precious cargo, we properly outfitted ourselves with smocks and shoe covers to enter the dairy. From a viewing platform above the action, we were able to watch as the giant vats filled with milk and were heated. The same steps take place every morning just this way, 7 days a week, 52 weeks a year. 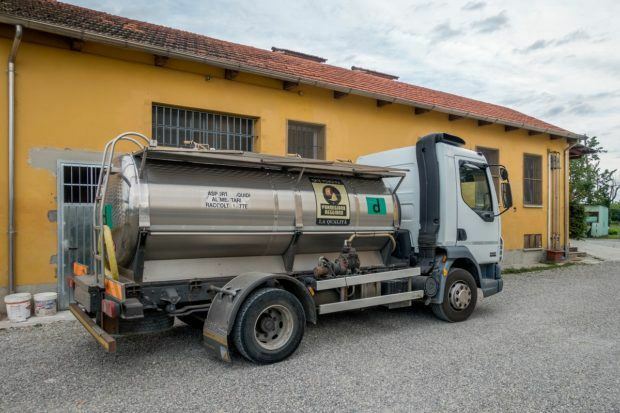 In fact, minus the trucks and some of the gadgets, the process of making Parmigiano-Reggiano has happened much in the same fashion for nearly 1000 years and will continue as long as there are dairies to do it. Parmigiano-Reggiano is one of the specialty foods of Emilia-Romagna. 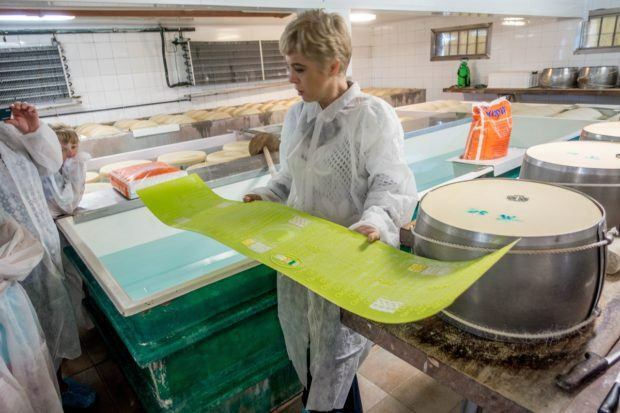 In Europe, it is a protected product with clear guidelines about its origin, ingredients, and how it is made. 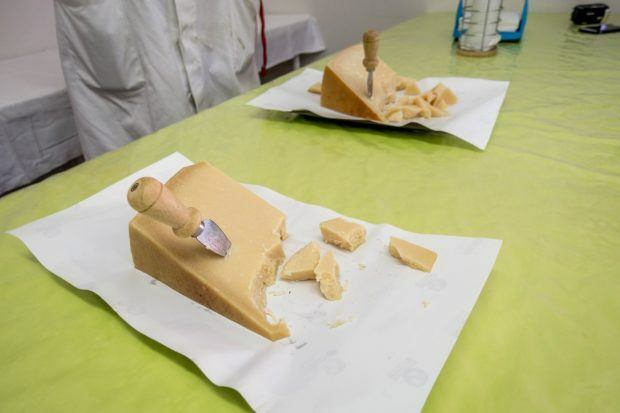 As Champagne is to France, Parmigiano-Reggiano is to Italy. 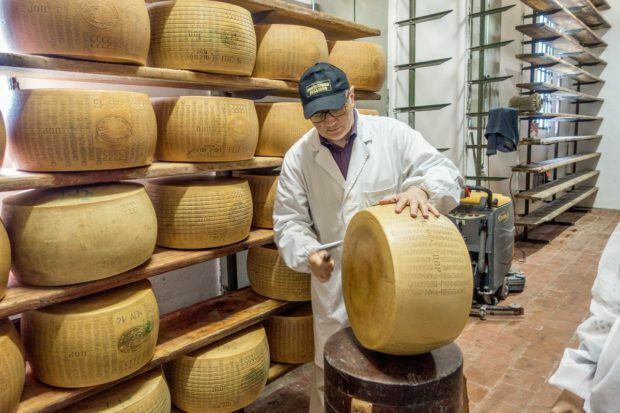 The hard, slightly salty cheese–sometimes referred to as Parmesan–can only come from Parma, Reggio Emilia, Modena, and parts of Bologna and Mantua. It can include only milk, salt, and an enzyme called rennet, which activates the curdling process. There are also restrictions about the time between milking the cows and making the cheese as well as procedures for determining which wheels are worthy of getting the DOP (Protected Designation of Origin) stamp of approval. 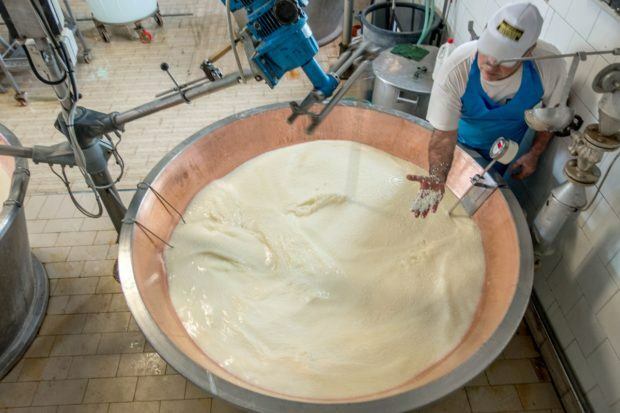 As we continued to watch, the cheese maker and his staff stirred and mixed the heated milk and enzymes waiting for the moment the curds would appear. There is an art to mixing everything in just the right way and keeping the timing and temperatures precise. 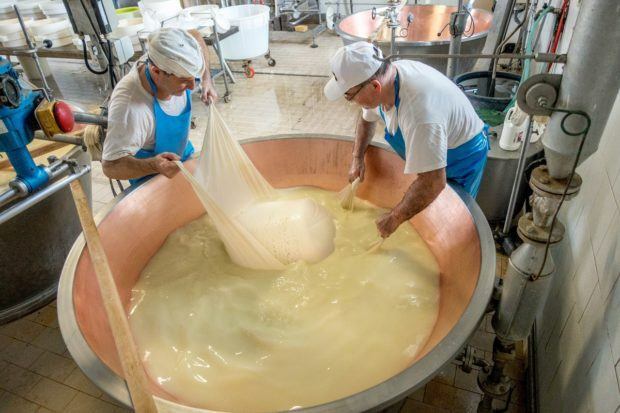 For many, cheese making is a family calling that is passed down through the generations, like so many things in Italy that require precision, finesse, and love of the craft. Soon, the giant hunks that would become Parmigiano-Reggiano were lifted to the surface and removed from their liquid home. That was our cue to make our way to the star of the dairy, the cheese aging room. Floor-to-ceiling cheese is pretty much my idea of heaven. After a stop in a saltwater bath, the wheels age in this room for at least 12 months according to DOP rules. Some stay here for up to two or three years and beyond. 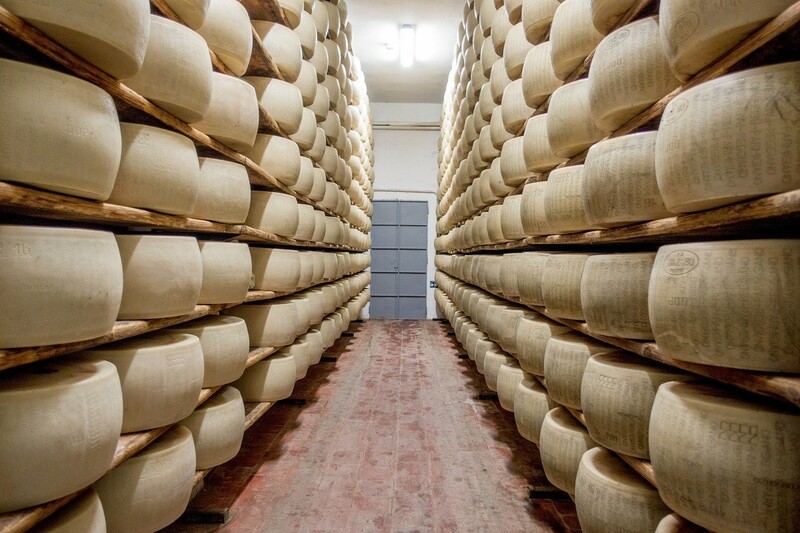 All the wheels of cheese are monitored as they mature to ensure their quality. Interestingly, this is done by tapping the cheese with a hammer that lets the monitor hear whether there are imperfections within the cheese. The last stop on our visit was the most delicious room in the dairy—the tasting room and gift shop. We tried cheese aged 12, 22, and 40 months. Each one had a slightly nuttier, stronger flavor than the last, but they were all enjoyable in their own way and worth getting up early for. We visited Parma as part of the Blogville project in coordination with the Emilia-Romagna Tourism Board and iambassador. All opinions of the artisan and cheesy are our own. 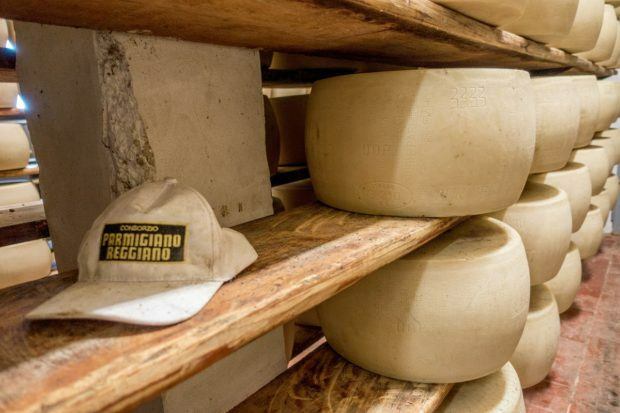 What do you think about Visiting a Parmigiano-Reggiano Cheese Maker in Italy? That sounds like a great activity to do in Italy. I really like finding things like this to do as we travel around the world. Local, cultural activities to really give us a feel for the place and its people. Plus I love cheese too and think I could get up bright and early for it! It’s certainly worth the early morning 🙂 Lots of fun. What an experience! I was just reading a book by Larry Olmsted called “Real Food” about how in the US all sorts of fake cheese is passed as Parmigiano. It must have been great to experience the real thing! Very nice! Is there ever a bad time to make — and taste — cheese?